Global Wheat Protein Market size was worth over USD 2 billion in 2017 and will witness over 4.2% CAGR up to 2024. Increasing demand for plant-based nutrition diet along with a growing vegan population in emerging economies will drive wheat protein market size. Suring aging population, rising income level and increased urbanization is likely to fuel product demand. Rising prevalence of deficiencies in low-income countries owing to limited access to high nutrition diets such as meat, fish, fruit, and vegetables will further boost industry share. Favorable government policies to reduce obesity and diabetes by limiting meat consumption will augment industry size. For instance, the Chinese government outlined a new policy to reduce its meat consumption by 50% by 2030. New dietary guidelines implemented by the country’s health ministry target to limit consumption between 40g to 75g of meat per person each day. Changing lifestyles in developing economies is supplementing the demand for ready to eat products. Surging preference towards vegan food products owing to increased lactose intolerant consumers is anticipated to boost wheat protein market share. Rising health concern such as high blood pressure, diabetes, arthritis, cardiovascular diseases is key factors providing notable shift. High health benefits accompanied by consumer demand for nutritious food positively influencing the product adoption in food supplement applications. Positive applications outlook from the animal feed by growing awareness regarding livestock health is anticipated to propel product demand as animal feed. Easy availability and cost-effective advantages will positively influence market penetration. Fluctuations in commodity pricing, including corn and barley likely to support product application scope. Major benefits such as high nutritional value, low fiber content, and a better TDN value compared to counterparts, including corn and barley driving wheat protein market share. Gluten intake has reported some health concerns including diarrhea, tummy upset, nausea, and gluten intolerance cases are limiting market growth. 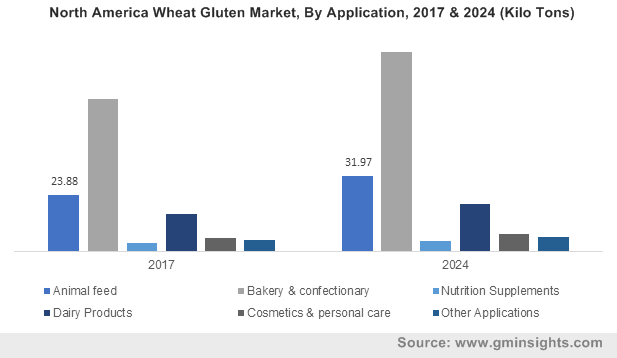 Growing food trend pertaining to gluten-free diet and increasing gluten intolerances are the key factors hindering wheat protein industry size. Wheat gluten market is projected to exhibit 4.4% CAGR from 2018 to 2024. Increasing demand for gluten concentration owing to excellent stabilizer properties mainly in food applications fostering market size. Growing demand for bakery products such as bread, cake, rolls, and pastries strongly supporting industry size. Strong application outlook from personal care products such as hair grooming products, skin moisturizing lotions due to its nourishing benefits is bolstering industry growth. 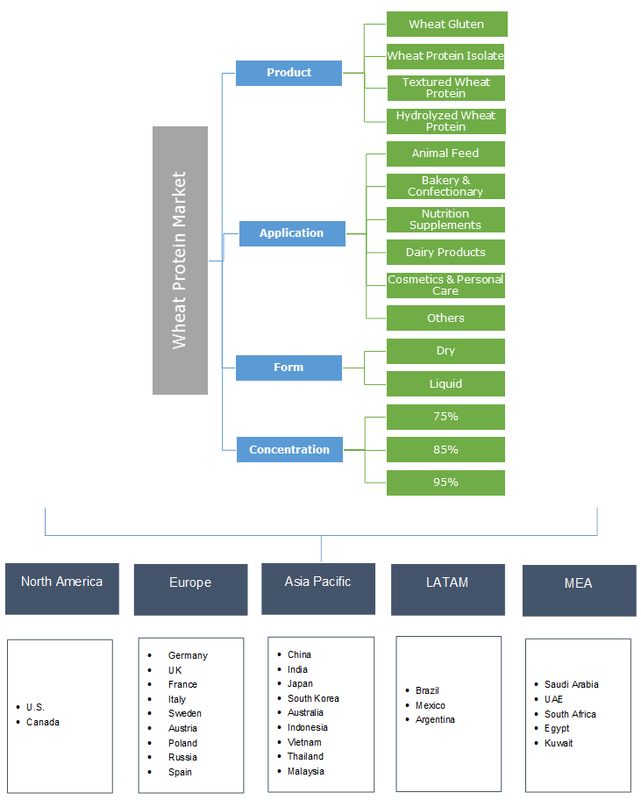 Wheat protein isolate market registered more than USD 590 million revenue share in 2017. This segment has gained wide attention mainly from sportspersons and athletes as a dietary supplement owing to its low fats, nutritious contents and carbohydrates contents. High physical exercises lose body nutrition has resulted in requirement for post workout supplements to recover protein content in the body. These concentrates are widely used in nutritional food products owing to a high protein concentration advantages fuelling market share. Animal feed market is expected to witness over 4.6% CAGR from 2018 to 2024. Balanced diet with nutritional supplements helps to maintain long-term health, body growth and meat quality. Farmers and feed manufacturers constantly improving proper nutritional elements to feed cattle, ruminants, poultry, swine animals and other animals. Increasing threat from deadly diseases animals due to improper diet and lack of nutritional quality bolstering demand for wheat protein products. Dairy applications will witness growth more than 3% up to 2024. Growing need for dairy-free ingredients owing to high lactose intolerance among numerous consumers is positively supporting the market growth. Manufacturing companies extending product range by introducing lactose-free beverages to capture dairy milk market share. Bakery & confectionary segment accounted over USD 1 billion revenue share in 2017. Major factors for growing wheat protein demand in the bakery industry include increased moisture content, increased water absorption and softness in the final product. Changing lifestyle is leading towards high products adoption of quick bite food items such as snacks and confectionary items. Increasing product adoption in the making of bread, pastries, rolls, cakes, and other bakery items to cater consumer demand will instigate industry expansion. Cosmetic & personal care market generated around USD 108 million in 2017. Shifting consumer trend towards adoption of organic and herbal cosmetic products are driving market growth. Plant-based raw materials are witnessing strong demand from personal care applications due to nutrient-rich benefits. Gluten concentrations are widely used in the manufacturing of hair nourishing and skin care products stimulating product demand. Shifting preferences for organic personal care products to avoid synthetic chemicals will boost wheat protein market growth during forecast time frame. Dry segment expected to capture more than 81% market share up to 2024. Powder form is highly preferred in the manufacturing process due to excellent compatibility with other raw material fuelling segment growth. Moreover, powder form is contamination free, easily measurable and high performance during the production process are key benefits stimulating product landscape. Liquid segment registered over USD 980 million revenue in 2017. Liquid gluten is widely used in the manufacturing of bakery product owing to excellent stabilizing properties fostering segment growth. Food application mostly needs high elastic and extensible with other raw material to enhanced product textures are major factors propelling product usages. 75% concentration segment is projected to observe more than 4.5% CAGR up to 2024. Inclining consumer preferences towards packaged food is augmenting the application scope. Moderate concentration is extensively used in varied manufacturing companies owing to excellent compatible benefits propelling segment growth. 85% concentration market accounted for over USD 700 million revenue share in 2017. Major production process requires balanced formulations of raw material to achieve the desired output. Higher concentrations offer less viscosity, less gelation, and unnecessary precipitation issues restrict industrial applications. North America market generated over USD 810 million in 2017. Busy lifestyle and hectic work schedule mostly in the U.S. and Canada are boosting consumption of RTE food products supporting regional growth. Changing diet pattern is leading towards the higher adoption of vegan food products to achieve nutritional gains. Increasing awareness regarding health benefits among fitness-conscious consumers strengthening demand for organic nutritional supplements for high wheat protein concentration products. Europe market is anticipated to observe over 4.1% CAGR up to 2024. Expanding product usage in biscuits, cakes, bread, and other bakery products are instigating wheat protein market. Surging demand for plant-based food products owing to nutritional benefits fuelling market growth. Germany France and UK are key countries contributing major revenue share owing to the improved adoption of organic products stimulating industry size. Growing health awareness has resulted in improved usage of vegan raw materials in cosmetic and personal care products. Nutritional gains, chemical free material and huge consumer base are key factors fostering market expansion. Wheat protein market is fragmented in nature owing to the large presence of domestic manufacturing companies. The major players are ADM, BASF SE, Cargill, Agrana, MGP Ingredients, Roquette, Glico Nutrition, Tereos Syrol, Agridient, and Manildra Group. Other notable players are Crop Energies, Kröner-Stärke, Anhui Reapsun Food, and Kerry Inc. The companies are adopting acquisition and new product development strategies to capture major market share. Wheat protein is plant-based product mainly extracted by washing flour dough. Strong end use application such as animal feed, bakery & confectionary, nutrition supplements, dairy products, and cosmetics & personal care. The product is a key supplement in animal feed industry to maintain a balanced diet and keep animal healthy for a long time. It is a viable substitute for animal-based protein coupled with improved benefits for consumers are lactose intolerant. Gluten has a vital role in the making of bread, cake, pastries and other bakery products owing to excellent stability benefits boosting applications. Most of R&D is focusing on enhancing product quality with gluten-free products will boost numerous product application during the forecast period.